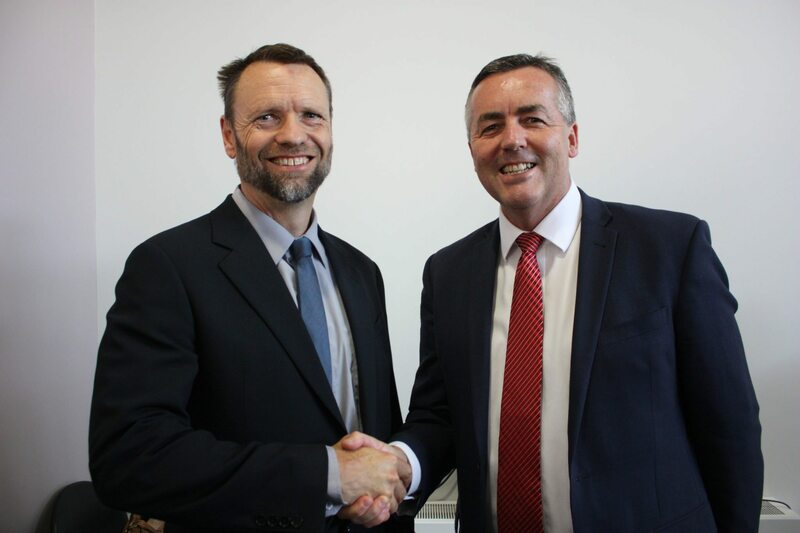 The Nationals Member for Gippsland Darren Chester congratulates Vince Hurley, managing director at Australian Sustainable Hardwoods (ASH) at Heyfield. ASH will receive $1.2 million for a project that will create a total of 54 positions. A $20 million Federal Government investment in industry and business in Gippsland is forecast to create more than 1200 new jobs. The funding, secured through the Regional Jobs and Investment Package, will be shared between 19 organisations to invest in projects that stimulate investment and create jobs in Gippsland. The Nationals Member for Gippsland Darren Chester today joined Prime Minister Malcolm Turnbull to announce the successful applicants and their projects. “This $20 million investment from the Federal Government will help drive economic growth and create jobs in Latrobe City, Baw Baw and Wellington council areas as part of the Federal Government’s response to the closure of Hazelwood Power Station,” Mr Chester said. “There’s no doubt the closure of the Hazelwood has had a profound impact on the Latrobe Valley. There were also many people who travelled from outside the Valley to work at the power station, so the impact of the closure has been felt further afield. “The fund provides a great opportunity for the private sector to work with government on projects that will make the Latrobe Valley and Gippsland economically stronger and more vibrant. “Latrobe Valley has been through some extremely difficult times over the past 12 months with the closure of Hazelwood Power Station and Carter Holt Harvey. The looming closure of Target and Coles Supermarket at Mid Valley Shopping Centre means more job losses for the region. Mecrus, which will get $3 million to build a large scale hydroponic strawberry glasshouse in Hazelwood to provide Australia’s first and largest protected environment for growing premium strawberry varieties, creating 80 construction jobs and 138 ongoing positions. Bambach Wires and Cables, which will receive $2.9 million to establish an advanced low voltage cable manufacturing facility and refurbish its existing factory in Rosedale, creating 47 construction jobs and 55 ongoing positions. Latrobe City Council, which will receive $2 million to fund its Morwell CBD Revitalisation project to transform Morwell town centre, creating 12 construction jobs and an estimated 300 ongoing positions. Drouin West Timber and Truss, which will receive $2 million to expand into a new combined factory and to acquire a new world-class automated CAD and CNC driven plant and equipment to reduce costs, improve capability and to compete in global markets, creating 40 construction jobs and 26 ongoing positions. Cool Group of Companies, which will receive almost $1.75 million to build an integrated manufacturing, sales and logistics facility in Morwell, creating 9 construction jobs and 19 ongoing positions. DefendTex, which will receive $1.5 million to build a manufacturing and testing facility for propellants and explosives at Dutson and become the base for the company’s resonance acoustic mixing facility to support the developments of rocket motors, creating 25 construction jobs and 60 ongoing positions. Australian Sustainable Hardwoods in Heyfield, which will receive $1.2 million for its twin band saw value recovery project to maximize the recovery of timber and minimise sawdust and wood chip waste, creating 14 construction jobs and 40 ongoing positions. Gippsland MTB mountain bike association, which will receive $976,950 for its Haunted Hills Bike Park project at Hernes Oak, creating four construction jobs and eight ongoing positions. Gippsland Rotary Centenary House, which will receive $900,000 to build 13 independent units and other infrastructure to accommodate patients and their families undergoing treatment at Latrobe Regional Hospital, creating 25 construction jobs and two ongoing positions. Baw Baw Shire Council, which will receive $800,000 to build an early learning centre at Warragul Primary School, creating 21 construction jobs and five ongoing positions. Gippsland Logging and Earthmoving, which will receive $762,795 for a project in Morwell to make bioenergy pellets from sawdust and residue used for heating, animal bedding and absorbant products, creating 12 construction jobs and 18 ongoing positions. Kempe Process Equipment, which will receive $619,200 to create a centre of excellence in Morwell to provide engineering, maintenance and report services, creating 5 construction jobs and 20 ongoing positions. Alberton Timber and Treatment Plant, which will receive $550,000 to construct a new post peeling facility to boost efficiency and reliability of its manufacturing process, creating 20 construction jobs and 4 ongoing positions. Utilitas Group, which will receive $515,597 for an advanced biorefinery laboratory and biohub design project in Morwell to process organic waste and produce renewable energy, creating 16 constructions jobs and 135 ongoing positions. Neerim District Soldiers Memorial Hospital at Neerim South, which will receive $150,000 to upgrade facilities for residents, creating 2 construction jobs. Audentes Investments, which will receive $123,600 to increase the value of medium and low value wild catch seafood products by extending its processing and chilling facilities in Sale and purchasing specialised processing and packing equipment, creating five construction jobs and four ongoing positions. Fabpro Group, which will receive $100,000 to construct a cordless factory that uses solar power and modular battery storage in Rosedale, creating two construction jobs and seven ongoing positions. South Gippsland Shire Council, which will receive $66,664 for its Gippsland Tracks and Trails feasibility study to capitalise on Gippsland’s geography and nature-based tourism assets, creating one short-term job and support 50 ongoing positions. KND Maintenance, which will receive $50,000 for pavement analysis system software to examine road pavements and predict maintenance needs, creating five construction jobs and 10 ongoing positions.